This beautiful hobby greenhouse kit is the perfect choice for both the hobby and professional gardener. Rugged reliability, low cost of ownership and amazing reviews are just a few of the reasons why Grandio Greenhouses is winning over the world's toughest users. Carefully engineered to perform in the harshest environments the 1.6mm profile aluminum frame provides a strong durable build. The heavy-duty construction and the 6mm twin-wall polycarbonate panels great even for winter insulation. A wide range of features and accessories culminates in a well ventilated growing space with sliding double doors, an easy-to-assemble system, and an estimated insulation R-VALUE* of 1.54 and heat loss U-VALUE* of 0.65 provide an amazing gardening and greenhouse experience. The doors hang from above which eliminates jamming and the door wheels are nylon for durability. Grandio Greenhouses are warranted to the original purchaser to be free from defects in material or workmanship for ten years from the date of original retail purchase on all plastic panels. Additionally, the aluminum frame is warrantied for life. This tab is being updated please call us for accessory details and discounts with greenhouse purchase. 1. Grandio Greenhouses are warranted to the original purchaser to be free from defects in material or workmanship for ten years from the date of original retail purchase on all plastic panels. Additionally, the aluminum frame is warrantied for life. The word "defects" is defined as imperfections that impair the use of the product. 2. Defects resulting from misuse, abuse or negligence will void this warranty. This warranty does not cover defects due to improper installation, alteration or accident. This warranty does not cover damage caused by vandalism, rusting, "acts of nature" or any other event beyond the control of the manufacturer. 3. This warranty is nontransferable and is expressly limited to the repair or replacement of defective product if the product is defective within the terms of this warranty, Grandio Greenhouses will repair or replace defective parts at no cost to the purchaser. Shipping charges to and from the factory or distribution center are not covered and are the responsibility of the purchaser. Labor charges and related expenses for removal, installation or replacement of the greenhouse or its components are not covered under this warranty. 4. This warranty does not cover scratching or scuffing of the product that may result from normal usage. In addition, defects resulting from intentional damage, negligence, unreasonable use will void this warranty. How easy is the Grandio to assemble? Very easy. We've designed and perfected the assembly process with you in mind. We provide the tools and a step-by-step assembly manual and video and if you have any problems you can call Grandio customer support at 1-866-448-8231. You may not need a permit for your Grandio, but it is always a good idea check before you get started. We recommend you check local ordinances and requirements before setting up your greenhouse. Is it strong enough for windy or heavy snow locations? Definitely. Grandiose are all designed to withstand the most hostile environments. We've added roof and have supports to increase the strength and durability of the greenhouse frame. Just follow the included directions for securing your greenhouse and you'll enjoy many years of growing with your Grandio. I live in the hot southwest will Grandio Greenhouses work for me? For people who live in high-temperature areas of the country like Arizona, Texas, California, Nevada, or New Mexico we recommend our aluminum shade net. The aluminum shade net reflects the sun on the hottest days to help your greenhouse keep it's cool. How do the automatic roof vent openers work? The opener has a metal cylinder containing a mineral which expands when heated. This pushes a piston that opens the vent. As the temperature cools, the mineral shrinks and a spring closes the vent and resets the piston. The opening and closing of the vent is gradual allowing just the right amount of airflow for cooling. No electricity needed! How large is the roof vent opening? The vent opening is 18-3/4" width by 22-3/4” length. What is the difference in polycarbonate thicknesses? Polycarbonate is available in several different thicknesses and normally comes in single, double, and triple walled sheets that can vary in thickness from 1mm to 10mm. A good rule to remember is that the thicker the panel the better insulation you'll have for your greenhouse. Your new Grandio ships in 3 or more manageable-sized boxes (the exact number of boxes depends on the size of your greenhouse). How hail resistant is this structure? Was is the difference between basic and premium on the 8x12? What type of base is needed to install this on? Can it be installed directly on ground or is some sort of crushed stone required? 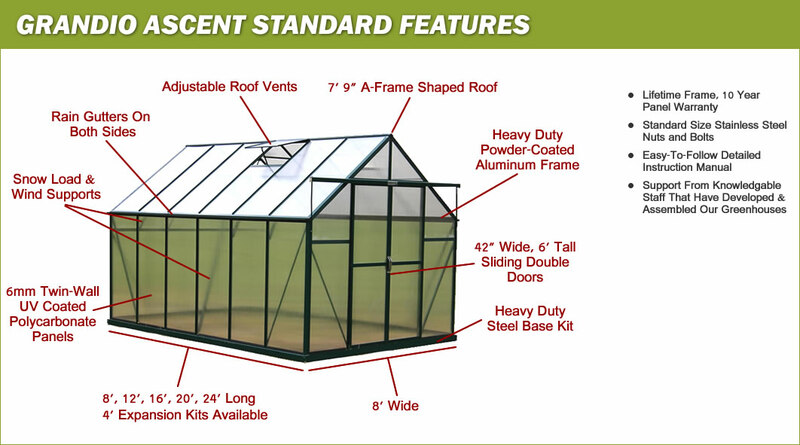 This Greenhouse can be placed directly on the ground.Please contact customer service for more options. How many roof vent windows come with the 8x16 model? If I start with an 8' greenhouse, can I add another section later if needed? Can the rain gutters be used to direct the water runoff into a rain barrel? What is the snow load rating for the roof? There is no official snow load for this unit. We are very confident that it can stand up to large snow loads and comes standard with extra supports to withstand heavy snow. How wind resistant is this? The Grandio Greenhouse are very sturdy and do great in windy areas. For windy environments, we recommend using the frame to base brackets. please contact us for more information and the possibility of including them with your greenhouse. Just received my greenhouse and cant for the life of me figure out how to attach 601A to the end of 619. Please can anyone help? you are best off calling the manufacturers customer service line at 1-866-448-8231.